Launch of iPhone 6 - Just an Hour Away! Home » News » Launch of iPhone 6 – Just an Hour Away! The world is as restless as the tech- market with the due launch of iPhone 6, the anticipated device by Apple embellished with the brand-new iOS 8. The Smartphone titan employed a Countdown timer at its official site, for all the desperate iPhone lovers out there. However, the details and venue of this mysterious event of iPhone 6 launch is not specifically known to any being. With infinite leaks over the past few weeks, a new leak has been reported on the very launch date, i.e. today, 9 September 2014, if one goes with the speculations, this leak confirmed all the prior rumors of what Apple has in its store for iPhone 6. 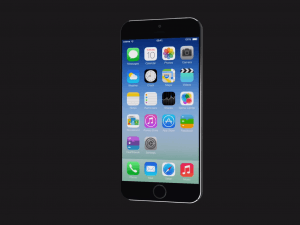 The iPhone 6 will be available in White, Space Grey and Gold color to the eagerly waiting users. The leaks confirm, that iPhone 6 will ditch its predecessor’s designs and will make its entry in soft-curved edge design with a slim and sleek design. The rumored 4.7 and 5.5 inches model will actually come in the same size as Apple learnt its lesson well, and decided to go for a larger display than its other trifling and compact ones. The glorious Sapphire glass screen will be used for the first time in history of Smartphones. Moreover, it will not just be Scratch resistant, but waterproof as well as shatterproof. iOS 8, unveiled at WWDC, is another rocking specification, which is surely adorned in the iPhone 6, and can be confirmed at 10 am, according to Apple’s Countdown time. With larger screen a sharper display with amplified resolutions are set to be launched in iPhone 6, as 828×1472 screen resolution is used in iPhone 6’s marvelous display. iPhone 6’s camera is another huge leap from Apple’s 8 MP camera in its present models. A mega- 13 MP camera with an obtruding camera ring with numerous latest and magnificent features, iPhone 6 camera will prove heaven to all the amateur photographers out there. Along with enhanced feature, Apple kept in mind to resolve a long-lived misery of iPhone users, as it emblazed iPhone 6 with 1810 mAh battery for its 4.7 inch model and 2,915 mAh for the iPhone Plus model of 5.5 inches. Power button shifted to the side, for easier user interface. If Apple goes with the flow, the expected price of the iPhone 6 is going to reach up to $1000 for the 4.7-inch model and above the $1000 mark for 5.5-inch model. The so-called event of Apple to unveil the iPhone 6 is still shrouded with secrecy. However, the jitters will pare down, in just a couple of hours, as Apple will incite us all to the smashing and stellar iPhone 6.